Straight from the skillet and onto your plate. 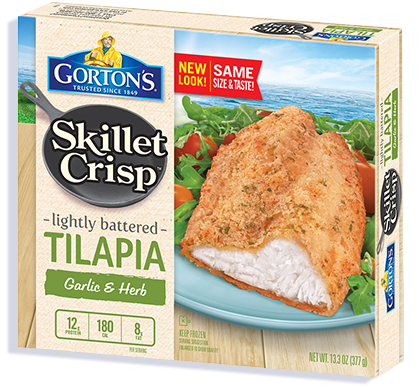 The mildest, flakiest fillets in our Tilapia Garlic & Herb are perfectly coated in garlic and herb seasoning, making every meal mouthwateringly delicious and easy to prepare. Tilapia fillets, batter coating, canola oil. Wheat flour, modified corn starch, water, tapioca dextrin, sea salt, maltodextrin, butter (cream, salt), garlic powder, sugar, whey, nonfat milk, baking powder (baking soda, sodium aluminum phosphate), parsley, spice, xanthan gum, natural flavor. Not a significant source of dietary fiber, sugars, vitamin A, vitamin C and Iron.